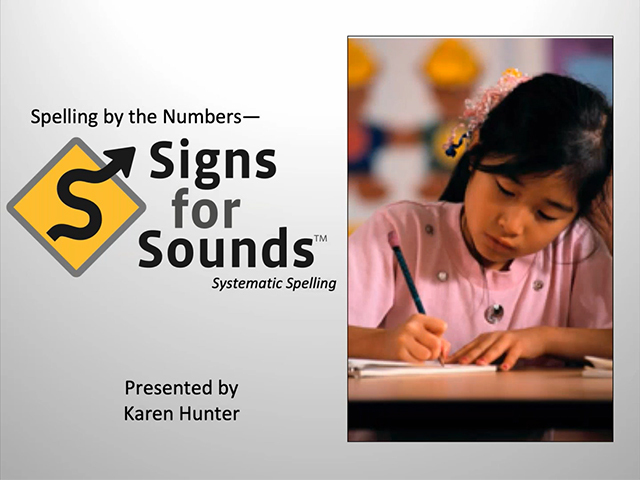 How To :: Webinar Video: Signs for Sounds: Spelling by the numbers :: Read Naturally, Inc. Presented October 24, 2018 by Karen Hunter, Read Naturally Educational Consultant. Teachers can work smarter—not harder—to provide highly-effective spelling instruction for beginning and developing readers. Learning to spell and learning to read rely on much of the same underlying knowledge—the relationships between letters and sounds. Did you know that 50% of words have regular spelling patterns, and another 37% are very close? Students need to learn these reliable patterns. And, this instruction has a positive impact on reading development! Did you know that 100 words make up 50% of the words children read and write? Obviously, these words have a high priority for our instructional time. Read Naturally’s Signs for Sounds™ uses research-based strategies to teach students how to spell sound-out words (with regular spelling patterns) and spell-out words (with irregular spelling patterns)—with a special emphasis on high-frequency words.